GOING GREEN is not merely a trend for yogis and hippies – it is a matter of social resp onsibility that will not dissipate into the abyss. Companies and Corporations are now more than ever being held responsible for their actions towards the environment and their communities. This is an issue that can no longer be ignored. In 2006, the movie Blood Diamond starring Leonardo DiCaprio brought the issue of diamond sourcing into the spotlight. The demand for ethically sourced diamonds immediately increased and the jewelry industry was forced to respond. The Kimberly Process which started in May of 2000 gained support beyond the realm of governments, industries and civil society as it became a household name. Danforth Diamond supports the Kimberley Process and will not buy or sell conflict or “blood” diamonds. This makes Danforth Diamond a registered StopBloodDiamonds.org jeweler. Danforth Diamond also offers a unique brand of diamonds called Harmony Diamonds which are natural diamonds that were mined from the earth; however, these diamonds have already been introduced into the jewelry supply chain and sold back to a jeweler, pawn shop or refinery for resale. RENEW, REUSE, RECYCLE. To learn more about Harmony Diamonds please visit: http://www.danforthdiamond.com/harmony-diamonds. The jewelry industry has not escaped the pressure to embrace the green revolution. However, with the strong focus on conflict diamonds and blood diamonds, the public tends to ignore the environmental impact of precious metal production. An engagement ring is more than just a diamond – consider the mining and manufacturing process. Danforth Diamond wedding jewelry is refined, not mined! 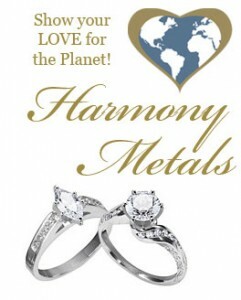 Danforth Diamond is proud to carry the Harmony Metals line because we believe in supporting the global effort to preserve our planet’s future. When you buy an engagement ring or wedding ring at Danforthdiamond.com, you are also supporting this effort. 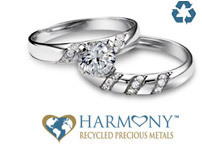 Every one of our engagement rings and wedding bands are part of the Harmony Metals brand. Love the earth as much as you love each other and purchase a ring made from harmony metal and gems! To learn more about Harmony Metals please visit: http://www.danforthdiamond.com/recycled-metals. It is good to hear that dan forth diamonds take such pride in their diamonds and metals. It is so important to know that it comes from a fair and credible source. I love how you start with it’s not just for yogis and hippies! Funny! I want to thank you for displaying your respect for what is right. I wish more companys would do the same. Social responsibility benefits all of us. Glad to see that you are making a difference with the industry. Thanks Jill. I didn’t notice StopBloodDiamonds.org existed and I have been campaigning for quite a while. Just signed up.